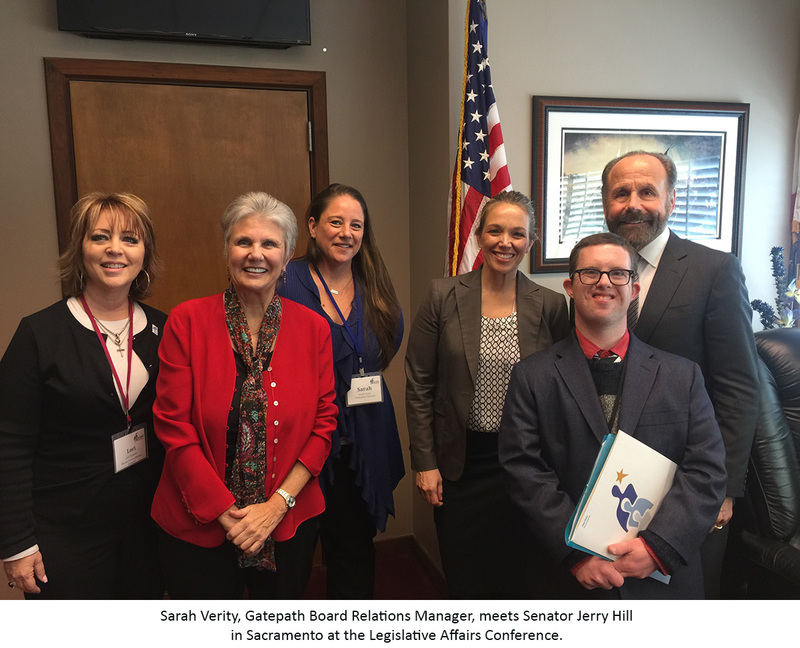 I was very proud to represent Gatepath at this year’s Legislative Affairs Conference run by the California Disability Services Association (CDSA), a statewide association representing nearly 100 community-based organizations that provide services to support and empower people with disabilities and their families. At the conference, providers from across California came together to discuss legislative matters that relate to our work and visited state legislators to express our collective concerns. I had the opportunity to attend meetings in the offices of Assembly Members Kevin Mullin (D-San Mateo) and Patrick O’Donnell (D-Long Beach), Assembly Budget Chair Phil Ting (D-San Francisco), and Senators Jerry Hill (D-San Mateo) and Richard D. Roth (D-Riverside). Overall, I felt the legislators were receptive to CDSA’s positions, which included the following points. Opposition to the governor’s budget proposal that reduces the annual number of service days for those with disabilities by four.In 2009, the Department of Developmental Services (DDS) implemented a uniform holiday schedule in an effort to reduce state expenses during the recession. A court injunction blocked the uniform holiday schedule, but the injunction has since been lifted.By way of example, this would mean that Gatepath would be required to close programs for four additional days per year, and the children and adults we serve would go four days without critical services. These forced closures seem particularly unnecessary given the State of California’s $6.1 billion surplus. Request a 4% systemwide increase in reimbursement rates to all community-based providers like Gatepath.The reimbursement rates paid by the state have been frozen since 1998. While the cost to provide critical services to individuals with developmental disabilities continues to rise, providers have not received an increase in the real estate rates set by DDS. An increase of 4% would amount to approximately $130 million from the general fund and match the percentage increase proposed by the Governor’s Budget for state employees.About a year ago, providers received some additional money as part of ABX2-1, and those funds allowed providers to give much needed raises to direct care staff. Unfortunately, with minimum wage on the rise, the increase is basically a wash. Additionally, ABX2-1 did nothing to address the rising costs associated with providing services, such as housing, gas, etc. DDS has engaged Burns & Associates to conduct a rate study to evaluate the reimbursement rates, but the study is not expected to be completed until 2020 at the earliest. An immediate increase of 4% would provide some much needed financial relief to providers in the interim. Legislators were also encouraged to support Assembly Member Chris Holden’s (D-San Gabriel) budget request for $25 million in bridge funding to increase rates for providers facing rising labor, housing, leasing, and fuel costs until the comprehensive rate study is completed. There is consensus among providers across California that many will be forced to close without some relief on reimbursement rates. Ensure that assets realized from the closure of the developmental centers remain in the system.The CDSA asked legislators to use funds from the sale or lease of the state developmental centers to develop integrated, community housing. At one time, the developmental centers housed 13,000 residents; today there are less than 650. It is no secret that California has an affordable housing crisis. These funds would go into a specific fund to develop housing for individuals with disabilities.Also, as the developmental centers close and current residents move to community settings, there will be net savings in operations. In fiscal year 2018-2019, the estimated cost per resident is estimated to be over $1 million. The current average cost to provide services to an individual in the community for one year is $20,000. The average housing cost for individuals who have already moved out of a developmental center is between $75,000 and $300,000 depending on the residence type. These savings are currently earmarked for people with developmental disabilities and should be reinvested in the community services budget to foster program development and supplement inadequate reimbursement rates. Protect choice and preserve options.The Lanterman Act is built on the principle that individuals have a choice when selecting their programs and choosing their providers. Home and Community Based Services (HCBS) requirements will necessitate that providers make program modifications by 2022. Today, California does not have an approved plan to meet the federal HCBS requirements. Providers need clarity on the changing federal rules so we can begin planning for any necessary changes by 2022.Lawmakers were asked by the CDSA to ensure site-based day programs continue to be options for individuals who choose to attend these programs. Until alternative options are in place, fully funded, easily accessible, and have a proven track record, California should not consider any limitations to existing program options. Support proposal to improve employment outcomes.Assembly Member Jim Frazier (D-Sacramento) has submitted a budget proposal to improve employment outcomes for individuals with disabilities without limiting choice. This is a follow up to last year’s bill – AB 1607, which received unanimous legislative support before being vetoed by the Governor, who indicated it is a budgetary issue.Frazier’s proposal would allow for individualized employment exploration and discovery to improve and increase community integrated employment (CIE) placements and aligns with the State Employment First Policy and the California Blueprint for Competitive Integrated Employment. The proposal also allows Work Activity Programs and Supported Employment Groups to design pathways to competitive integrated employment settings with individualized job discovery and skills training, consistent with individual choice. Recently, the Assembly met to discuss the DDS budget. Assembly Member Jim Wood (D-Healdsburg), seconded by Assembly Member Devon Mathis (R-Visalia), moved to reject the Governor’s proposal to re-implement the uniform holiday schedule. However, due to technical procedural rules, the item remains open until the May revise hearing. This adds an extra layer of difficulty for providers like Gatepath because we are preparing next year’s budget now. As we approach our 100th anniversary in 2020, all of us at Gatepath understand the critical importance of being a voice for those we serve, and proactively working to secure a sustainable safety net of services for individuals with disabilities for the next 100 years. Please join the effort by signing up for our advocacy action alert network at PledgeForInclusion.org and lend your voice.